Anyone who knows me personally, knows that I’m the resident chef in our family. It’s not that Kathy (my amazing wife) can’t cook. Far from it, she’s really great in the kitchen. But because I work from home, it’s simply that I’m the one with the most time to spend on cooking, since she has a demanding job as a nurse. Luckily, I’ve always had an interest in cooking, ever since my childhood days spent helping my grandma in the kitchen. Whether it was sitting on the doorstep shelling peas, weighing out flour, or peeling potatoes, I loved being in the kitchen, which felt more like a magician’s inner sanctum than just another room in the house. When it came to cooking, my grandma was a true miracle worker. I never once saw her look up a recipe for anything, and there were no cookbooks anywhere in her kitchen. Of course, her talent was the result of many years of practice and experience as a professional housekeeper, but to my younger self it seemed like magic. But what does cooking have to do with your photography business, or marketing? This particular loaf of bread looks great, and I can’t wait to try it, but that wasn’t always the case! I’m embarrassed to say that my first attempt more closely resembled a house brick than a loaf. It was brown and rectangular, but that was as close as it got to being pleasant to eat. I didn’t follow the recipe because I thought I knew what I was doing. I knew bread had several basic ingredients—flour, salt, sugar, yeast, water, and a little oil. I also knew it had to mixed properly, there was some kind of “kneading” involved, and it had to be left to rise before baking. But, I lacked the experience to know what consistency the dough needed to be, exactly HOW to knead the dough (contrary to my belief at the time, kneading is not a synonym for giving it a rough beating) or for how long, and how much time it would take to rise. Something that looked like it had been mined from a quarry instead of lovingly created in a kitchen. 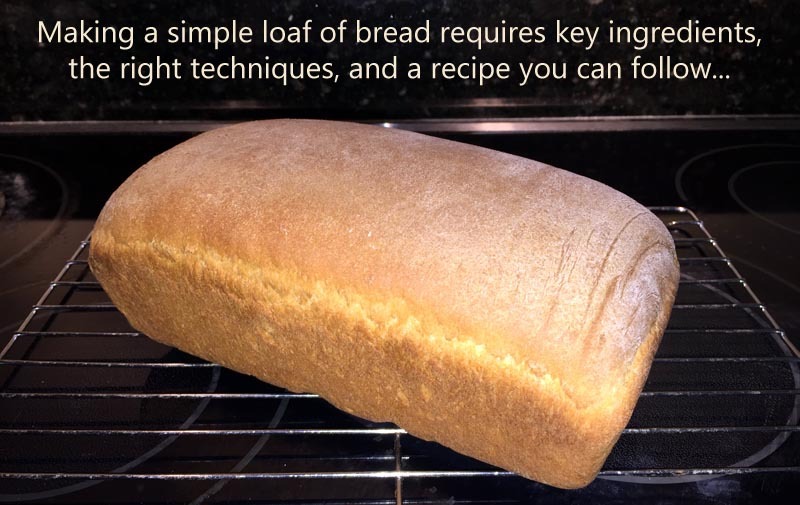 A little despondent, I refused to give up and went in search of a recipe, and then I watched some tutorials on exactly how to make basic bread. Marketing your photography has many similarities to cooking. Yes, you can create marketing campaigns without a recipe, as long as you have the right experience and you instinctively know what you’re doing. Some folks are exceptionally lucky. They seem to have a built-in sense of exactly what to do and when, whether it’s in the kitchen, or as a marketer. Great chefs and great marketers alike just know when something is right or wrong. Sadly, the rest of us need recipes and practice. And we have to be careful not to confuse ingredients for recipes. For example, you don’t have to be Gordon Ramsey to know that flour is an ingredient, and not a complete recipe for making bread. But, as a marketer of your photography, the distinction between ingredients and recipes may not be so obvious. The other day, a photographer asked her fellow Facebook group members if they could help figure out why her recent mini-session promotion had failed. Her photography was good enough, the offer looked attractive, and she had made a good effort at creating a sense of urgency for her prospects. But, after posting it on her Facebook page, she got zero bookings. Simply publishing an update on a Facebook page to advertise a mini-session promotion is merely an ingredient in what should be a much larger recipe, yet I see many photographers make the mistake of treating it as a standalone piece of marketing. In other words, she confused the ingredient for a complete recipe, resulting in a different outcome to what she expected. If your marketing efforts are drawing a blank, I urge you to think seriously about what we’ve talked about here. Take some time to examine your marketing to make sure you have the correct ingredients for what you want to achieve, and you’re putting them together according to an effective recipe (aka marketing strategy). You’ll be surprised at what you find when you start to look at things this way.